This Blog Post is connected to following site. Please check it and all Photo Albums which are to find there. From December 12th till 23rd, 2014, I participate with my poster „Enough of White in Green“ in 7th United Designs poster exhibition in Wuxing Gallery at the Shanghai Normal University (SHNU) in China. I was personally invited by PhD Albert Inyoung Choi, the Initiator and Director of United Designs, to be the Keynote Speaker in 3rd Global Visual Culture Symposium and in my speech present my interdisciplinary SPIRAL-CHANNELS project which I develop since 2004. and realized until now in eight European countries. This I understood as a honour and am thankful very much. So I got the chance to promote also all eight places and countries where we realized the Spiral-Channels. So also both of my home Countries: Croatia and Principality of Liechtenstein. In this my work in progress is concentrated very much of good energy of one big group of creative personalities from different parts of the world who participated until now in that complex project with many layers. To get the chance to forward this energy is for me a big privilege. In the Alps there were some turbulences in the flight time of the „Swiss“ Airbus LX188. Everything else on this flight was fine enough. After a very short break after my coming to Shanghai I visited University Campus and Gallery where the exhibition was prepared at that time. On the evening, in dinner time in Mongolian Restaurant Professor Choi explained the program for next working day to me and to Professor Kelly Salchow MacArthur from the Michigan University in the USA. Interesting is by Kelly not just that she is one of the most important Graphic Designer in her University but also that she was an USA representative in Olympia in Sidney and Athen. 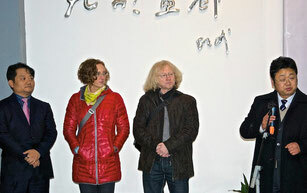 On December 12th, at 3.00 AM there were the opening of the Symposium. First told an official from the SHNU, after that Prof. Choi, director of global design and management at Hanyang University in Korea and then I hold my speech about the interdisciplinary work in progress SPIRAL-CHANNELS project, which I develop since 2004 in Estonia. 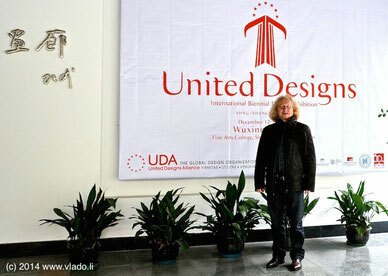 At 6.00 AM the exhibition 7th United Designs was also opened by PhD Liu Xuguang, dean for Art and Design Department in SHNU. 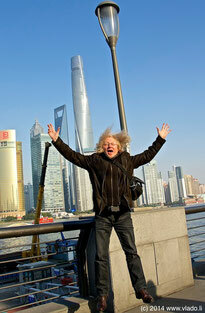 All that I see as positive Attitude of common international work by Graphic Designers and Fine Artists. I could no one internet site open with the ending .li. So I couldn’t work online from Shanghai as I wanted. I knew before my travail to China there is no possibility to open google, youtube, facebook sites but what have my own sites to do with American-Chinese problematic?! But very interesting to me was that I could open some Croatian sites, which I most visit when I am also in Liechtenstein. I could so for example listen one Croatian radio, favorit radio station of my wife and me. From one to another moment I couldn’t charge the battery of my Mobil phone. This made me very nervous. What made me here in Shanghai very glad was the seeing and listening again my old friend (prof. Choi) live and meet new friends! One of these is prof. Karolina Komasa, dean of Faculty of Sculpture and Space activities in Poznan, Polen. She is one of two persons who gave me to know, they are interested in SPIRAL-CHANNELS and will think about how to realize new CHANNELS in theirs homelands. I hope very much this information will be also very interesting to financial supporters of my participation in Shanghai: RHW Foundation and yellow page welcome.li from the Principality Liechtenstein. I want thank here very much to them, as also to daily newspaper in Liechtenstein called „Liechtensteiner Volksblatt“ which was my main info media Sponsor. Thanks also to all other international internet portals who published information about this my way.